Home Feed How long do chickens lay eggs? Backyard hens can lay up to 250 eggs in their first year with higher egg counts starting in spring. With spring in full force and days getting longer, backyard flock raisers are experiencing two fun moments: New baby chicks and egg production picking up again from the adult flock. Whether it’s the first egg at week 18 or the first egg of the spring season, there’s nothing like the first egg happy dance. But how long do chickens lay eggs? 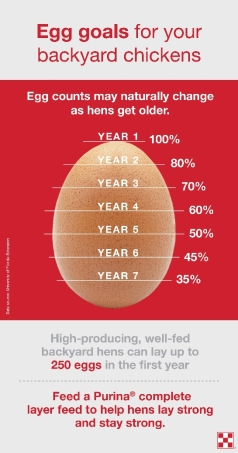 And do egg counts change as laying hens age? Patrick Biggs, Ph.D., a flock nutritionist for Purina Animal Nutrition tackles egg goals in this article from the Purina Animal Nutrition Center. Popular egg-laying breeds likely to meet these goals in year one include: White Leghorn hybrids (white eggs), Plymouth Barred Rocks (brown eggs), Rhode Island Reds (brown eggs), Blue Andalusians (white eggs) or Ameraucanas (blue eggs). Dual-purposed breeds like Plymouth Barred Rock, Sussex or Buff Orpingtons will typically also achieve top performance. Research from the University of Florida (see Figure 1) shows estimated egg production naturally declines each year. Overall, 80 to 90 percent is considered excellent egg production (100 percent = 1 egg per hen per day), but breed, housing, weather, management, parasite load and nutrition can all affect the rate of lay of your hens. Remember, most hens will naturally slow down in the fall and winter unless you add supplemental light for a consistent 16 hours of light per day. At about 2 years old, you can estimate a hen will lay about 80 percent the eggs she did in her first year. So, if your hen lays 250 eggs in her first year, you can estimate she’ll lay about 200 eggs under ideal conditions in her second year. When your hen is in her third year of laying, you can estimate to have just under 70 percent the production of the first year, and in the fourth year of laying about 60 percent of the first year’s production. See the accompanying graph from the University of Florida to help estimate the number of eggs you can expect from your flock each year. “The biggest contributor to great egg production and hen health is great chicken layer feed,” Biggs says, outlining the Purina® Flock Strong® Feeding Program. “To help laying hens stay happy, healthy and productive, feed a Purina® complete layer feed that includes Purina’s Oyster Strong® System. Purina® complete layer feeds are formulated to provide all 38 unique nutrients laying hens need to lay strong and stay strong – no need to supplement. To feed chickens, start with a complete starter-grower feed from day 1 to the first egg around week 18. When the first egg arrives, transition to a complete layer feed and feed it for at least 90 percent of the laying hen’s diet. Laying hens eat approximately 0.25 pounds of complete feed each day, which is about the same as one-half cup. When putting the 90/10 rule into practice, this means treats should not exceed 2 tablespoons. A few small treats are all they should have each day. To learn more about the Purina® Flock Strong® Feeding Program and to receive a coupon to try Purina® layer feed, visit flockstrong.com or connect with Purina Poultry on Facebook, Pinterest or Instagram. Purina Animal Nutrition LLC (www.purinamills.com) is a national organization serving producers, animal owners and their families through more than 4,700 local cooperatives, independent dealers and other large retailers throughout the United States. 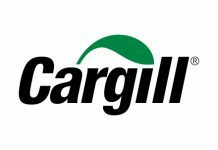 Driven to unlock the greatest potential in every animal, the company is an industry-leading innovator offering a valued portfolio of complete feeds, supplements, premixes, ingredients and specialty technologies for the livestock and lifestyle animal markets. Purina Animal Nutrition LLC is headquartered in Arden Hills, Minn. and a wholly owned subsidiary of Land O’Lakes, Inc.